John Katko won reeleciont, but will be returning to Washington as part of the minority next year. Dana Balter, the Democratic candidate for the 24th congressional district in New York, speaks to supporter Allison Kirsch after learning of her predicted loss. Rachel May, a candidate for State Senate, is interviewed by a CNYCentral reporter. Syracuse city councilor at large Michael Greene gives a speech at the Onondoga County Democratic Committee's midterm election watch party after having his victory predicted. Debbie Cummings and Donna Coloton Forman celebrate predicted Democratic victories at the Onondoga County Democratic Committee's midterm election watch party. Both campaigned for the N.Y. state senate campaign for John Mannion. Bill Magnarrelli won his district to continue being a representative in the New York state assembly. Magnarelli is from Syracuse, N.Y. Congressman John Katko will serve a third term as New York’s representative from the 24th district after he defeated Democratic challenger Dana Balter on election night. Katko says he won’t be changing anything about the way he governs, even though Democrats now control the House. 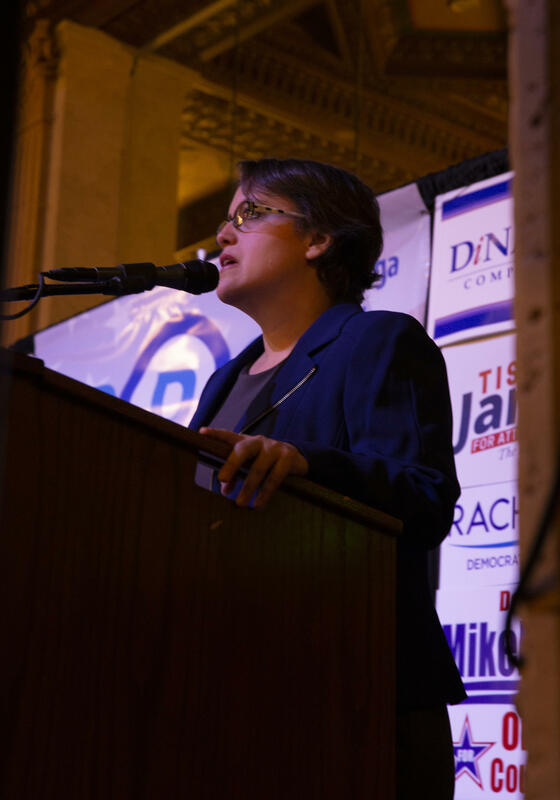 Dana Balter, the Democratic candidate for the 24th congressional district in New York delivers a speech at the Onondoga County Democratic Committee's midterm election watch party. Balter says that although her campaign is over, the movement to restore faith in democracy will continue. In her concession speech she reflected on her campaign and tried to energize her supporters. In his acceptance speech Katko credited Balter for running a good campaign and for being a challenging opponent. He also says even though the House flipped to blue last night, he still remains committed to reaching across the aisle in a bi-partisan fashion. Katko took the race 52%-46% over Balter. 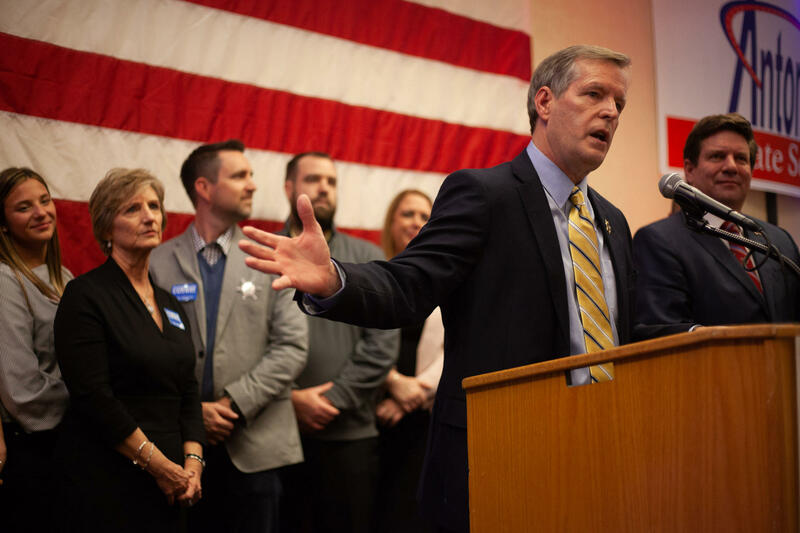 In the 22nd District, Democratic challenger Anthony Brindisi declared victory over incumbent Claudia Tenney, tallying a 50%-49% edge Tuesday. Brindisi's excitement level was palpable in his victory speech. However, Tenney’s campaign says there is a 1400 vote difference, but 10,000 absentee ballots left to be counted – so she’s not conceding. We’ll Turn to local state assembly races now … and it was good to be an incumbent. Democrat Al Stirpe will be heading back to Albany. He urged supporters to stay engaged. Stirpe won 57% to 41% for Nicholas Paro. Bill Magnarelli kept his seat by an even wider margin. He has a list of priorities to tackle as he goes back for his eleventh term. Gary Finch continued the incumbent’s success, topping Keith Batman 55-42-percent. Will Barclay and Pam Hunter also won reelection. Another Republican will fill the seat that was held by Senator John DeFrancisco for more than 25 years. Bob Antonacci narrowly defeated Democrat John Mannion 51% to 49% in the wide-open 50th senate district race. But Antonacci will be in the minority after Democrats wrested control of the chamber. He says that means he’ll just have to reach across the aisle. If he fulfills his bipartisan promises, Antonacci will be working with Democrat Rachel May, who won the Senate race in the 53rd district over Janet Burman. May is a political newcomer who defeated incumbent Dave Valesky in the Democratic primary. The Democrat wants Albany to have more of a CNY flavor. She beat Janet Burman, 49%-36%, with Valesky drawing 11% on minor party ballot lines. Gene Conway continues as Onondaga County Sheriff. Republican Gene Conway will continue to run the County Sheriff’s department as he defeated Mike Montes 56%-44%. Last night he was already thinking about getting right back to work. And Michael Greene will keep his seat in city hall. He won the councilor at large race over Norm Snyder and Frank Cetera. Greene won a special election, after being appointed to fill a vacancy in the seat … he’ll have to run again in a year to gain a full four-year term. The final tally: Greene-70%, Snyder-23% and Cetera-7%. Ann Magnarelli (69%) took the City Court Judge race over Jason Zeigler (18%) and Shadia Tadros (12%).